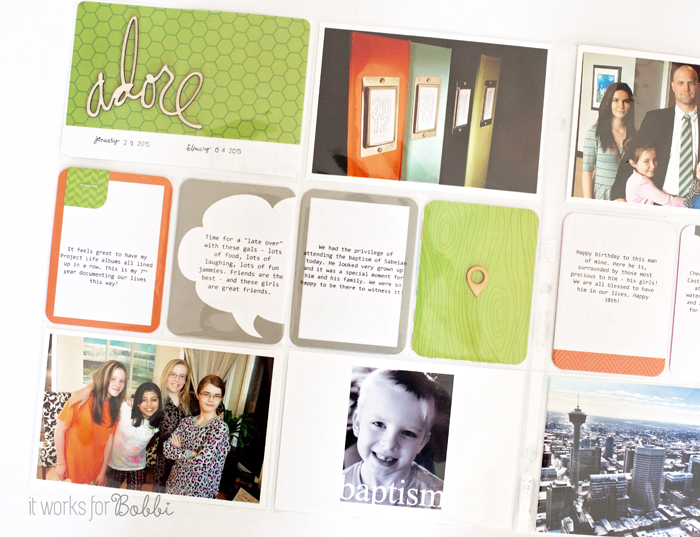 March Project Life Blog Hop – It Works For Bobbi! Published on March 9, 2015 August 10, 2016 by Bobbi-Jo G.
Welcome to the third of 12 blog hops from the 2014 Project Life Creative Team! Have you been having fun hopping along with us, each month? There is such a lot of inspiration oozing out of these ladies, am I right? We love this small way of continuing to share what we’ve been working on with our friends – all of you! 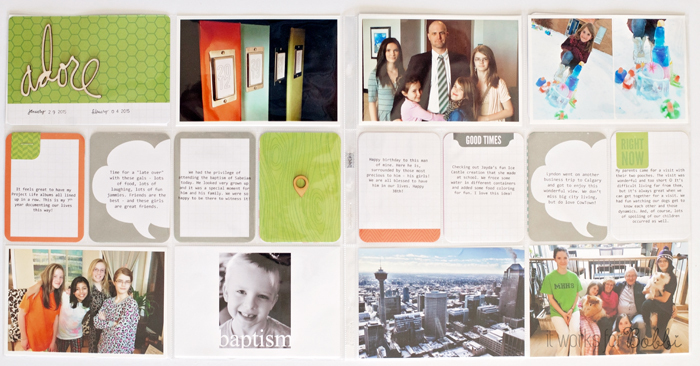 This layout was done using cards from Heidi’s Favorite Things core kit. I love the happy colors and her fun signature style. I’m definitely a Swapp monster! 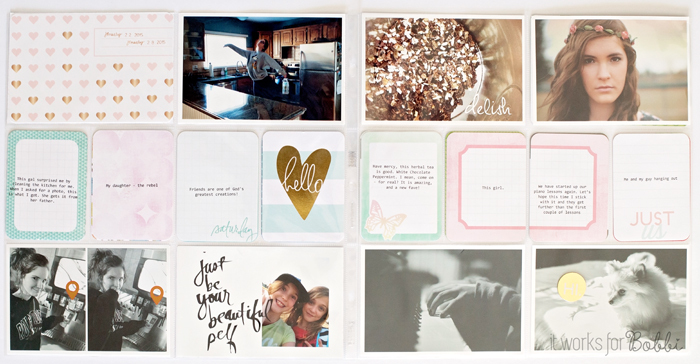 I’m also using my favorite Tracey Larsen digital templates to create those fun two-shot 4X6 photos, as well as the ones with just one vertical photo on a 4X6 canvas. 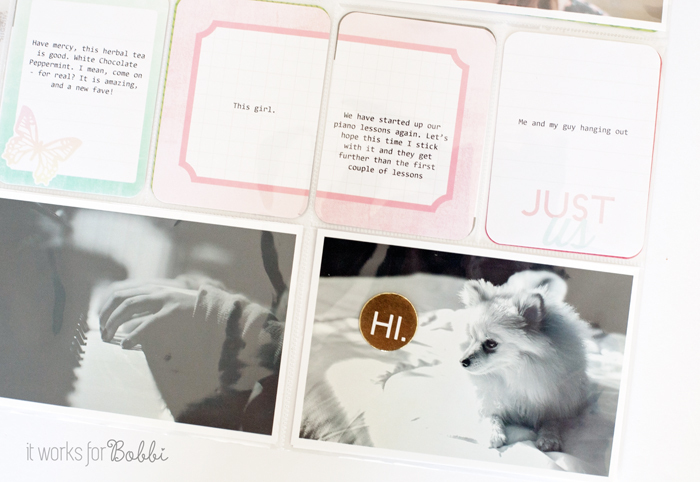 This kit used cards from Heidi’s Dreamy Core Kit as well as elements from her Gold Foil Value Kit. It’s kind of hard to see in these photos, but the “Hello” card and the little circle “hi” on the lower right hand photo are both gold foil – I totally love gold right now! I have decided to print my photos all with white borders this year. I think it gives a more uniform look to my pages. I’m loving it. Please note that these are fun and optional blog hops. If you don’t see your favourite former team member, please visit their individual blogs to see what they are up too! We hope you enjoyed this hop! Previous February Project Life Blog Hop! Next Spring Cleaning Your Computer! A 3-week "Clean Computer Calendar"
LOVE the white borders! These look fantastic! Great work.